We are looking for forward thinking garages to become part of our growing network. We have a legal contract with exclusivity rights in place for Jacksons MOT Centre in Northampton. This exclusivity extends to all of our network partners in their respective areas. Once you have joined our network, you can rest assured that we will not provide any facilities to other garages in your area (see red circle on the map) If you would like to join us and enjoy our exclusive benefits then please follow the link. Please note, this is a first come first serve agreement. 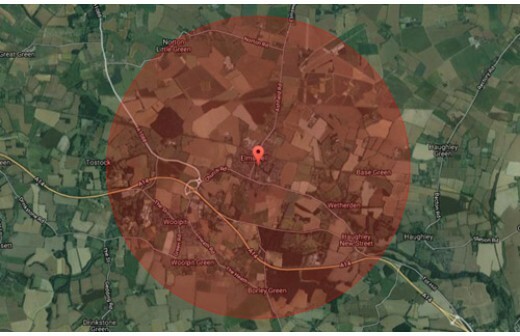 Exclusive Territory: Website Territory based on 2 miles diameter premises. paid upfront charged at £600+VAT. Auto Garage network guarantee the site investment and monthly cost will be self-funding. Monthly Charges: £75+VAT(including hosting)which equates to £900+VAT yearly. If paid upfront charged at £600+VAT. With this option, Auto Garage guarantee a dramatic improvement in Google rankings. Monthly Charges: £500+VAT for 12 month period, with blanket search engine optimisation. With this option, Auto Garage will use SEO via a specially trained and exclusive team which will ensure the first-page position using top keywords locally on Google. Auto Garage are so confident that this option will pay for itself and make a profit if the site doesn’t cover the investment Auto Garage will pay back the difference. Is partworn tyres service available on your garage? "Website" means the Partner website and its associated Domain/URL. 1.2 Any reference in this Agreement to writing includes email, facsimile transmission or any similar means of communication. 1.3.4 reference to any English legal term for any action, remedy, a method of judicial proceeding, legal document, legal status, court, official or any legal concept or thing shall in respect of any jurisdiction other than England be deemed to include what most closely approximates in that jurisdiction to the English legal term. 2.1 The Contract Term consists of an initial period of 12 months (the "Initial Term") and subsequent renewals. At the end of the Initial Term, this Agreement will automatically renew for subsequent periods of twelve months each, unless and until terminated pursuant to the attached terms and conditions. 3.1 The service scope includes the development, provision, on-going availability, support and maintenance of a website for the Partner pursuant to this Agreement. In the unlikely event of a fault or service issue, Auto Garages will usually rectify any reported design/content fault immediately but reserve the right to ask for a total of seven working days to make good. 4.1 In consideration of Auto Garages providing the Service described in clause 3, the Partner Organisation will pay the Monthly Fee shown on the cover sheet (plus any value added tax that may be chargeable) for the duration of this Agreement, subject to annual review by Auto Garages with the Partner being given at least 30 days' notice of any change to the Monthly Fee as result of such review. 4.2 The monthly fee shall be payable by the fifth day of each calendar month in which the service will be provided. It shall be paid to Auto Garages by Standing Order to the bank account specified on the initial Invoice at the start of the Contract Term. After an initial period of 12 months, the usage of the VRM lookup system will be reviewed. 4.3 Auto Garage will refund the monthly fee if 5 sales, either directly from the website or from associated phone calls, are not achieved in any given month. 4.4 Auto Garages reserve the right to periodically monitor the performance of each partner website activity to assess the volume of traffic generated, this will include phone calls (to enable this, calls may be directed to a third party number). This process will only be carried on a short-term basis unless prior arrangements have been made. 4.5 If a partner wishes to be included in on-going site development which means, the website is continually connected and monitored allowing all updates to be directly sent to the partner site (Auto Garage intend to commit 50% of its yearly turnover to further site development) an annual subscription fee of £1000+VAT will apply and will be charged at commencement. 4.6 Any required amendments to the site and/or system after an initial 4 week period will be charged for at £25 per hour (an assessment of the necessary hours will be quoted prior to the commencement of work). 5.1 Upon contract initiation, the Set-up Fee and first month’s Monthly Fee become due. A single invoice will be provided at this time covering the Set-up Fee and the Monthly Fees to be paid over the following twelve months. 5.2 Invoices will not be issued for individual Monthly Fees to be paid during any 12-month period. 5.3 On each anniversary of contract initiation, an invoice will be provided for the Monthly Fees to be paid over the following twelve months. 5.4 These annual invoices are important documents which will be required by your accountant and/or finance department. 6.1 After (the "Initial Term") either party may give six months’ notice of termination of this Agreement in writing. 6.2 During (the "Initial Term") should the “customer” choose to terminate, they will be liable to pay in full for the remainder of that term. 6.3 At contract termination, the Partner Organisation’s original website (where applicable) will be restored to the Partner’s Domain. It is the sole responsibility of the Partner Organisation to confirm to Auto Garages its new hosting arrangements; this must be done at least 30 days before the six months notice ends. If the partner fails to keep admin access details protected, either by accident or design by any party and this results in third-party exposure. To this end, Auto Garages will track IP addresses where login occurs. The garage owner will be ‘personally liable’ for any losses that may occur in these circumstances. Failure to pay any fees payable to Auto Garages. In this event, Auto Garages will suspend the site and charge for its reinstatement. 7.1 In the unlikely event of business failure of either party, this contract will necessarily become void. 7.2 If the Partner Organisation business fails, Auto Garages will seek payment of any outstanding Set-Up Fee from the Partner Organisation’s administrators. In all other respects, Clause 6 Termination applies. 7.3 If Auto Garages business fails, the Partner Organisation will be given license to use its extant website in perpetuity. When the Partner Organisation informs Auto Garages of its new hosting arrangements, Auto Garages will manage a transfer of the website to ensure Partner Organisation business continuity. 8.1 Auto Garages will give an area of exclusivity. This will be a minimum of a two-mile diameter from the “the customer’s” usual business premises. If a wider ‘exclusion’ area is requested it will be the subject of separate negotiation. 8.2 “Exclusive Area” denotes the area that must not be entered by another “customer’s” premises. Meaning that whilst another customers business premises is outside of the “Exclusive Area”, each customer's exclusive area may overlap. 8.3 Should the agreed area of exclusivity be breached. Auto Garages will become liable for the sum of £100,000.00. If an existing partner re-locates the exclusion area will relocate with him unless he moves within another partners exclusion zone in which case his ability to use our service is forfeit. 9.1 The Partner will approve the initial Partner Organisation-specific content to be included on the Website, including its product and service range, facilities and opening hours. 9.2 Auto Garages will adhere to all points in the “Our Promise” section. 9.3 Auto Garages reserve the right to promote any tyre brand, tyre and/or parts supplier or any other business connected to the automotive industry. In our experience, after a period of three months, your website will become self-funding. If after 12 months you can prove that this is not the case,* Auto Garages will refund the difference. * You will be required to log customer calls, promote using social media and improve your search engine optimisation. If your search engine ranking is initially low, this will affect your cash positive period. Please speak to your representative to discuss ways to improve this. I agree to be bound the above terms and conditions.